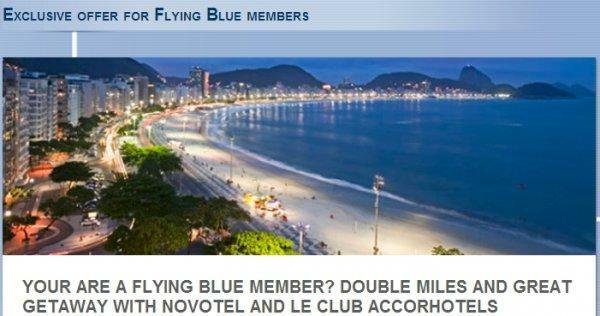 Le Club Accorhotels has an offer for Air France-KLM Flying Blue members that can earn double miles for Novotel stays between March 19 and May 4, 2014. This offer comes with a preferential rate that needs to be booked 21 days in advance in additional to the double miles. You can access this offer on Flying Blue’s website here . Note that you must have selected to earn airline miles instead of Le Club Accorhotels points and have the auto conversion of points to miles selected. You can read more about how to enable this here. Le Club Accorhotels often has promotions for Air France-KLM Flying Blue members. The reason for this is likely that both are French companies. This offer allow Flying Blue members to benefit from Le Club Accorhotels double points which are automatically converted into Flying Blue miles if Flying Blue members chose this option. 1. General Le Club Accorhotels terms and conditions apply to the “Double miles with Novotel and enjoy great getaway” offer. 2. This offer is valid for any stay done between March 19th, 2014 and May 4th, 2014 in one of the participating hotels, and booked between February 26th, 2014 and April 13th, 2014. 3. This offer entitles Le Club Accorhotels Loyalty members, regardless of their status, to benefit from earning double points in one of the participating hotels. 4. You must book your stay ahead of time on-line to benefit from this offer (www.accorhotels.com).